Perhaps the time for Erik Satie has really come at last. Even decades ago his music was part of a coffee commercial, there were synthesizer arrangements, new age versions, he was loved especially for his lyric wonder, the first of the "Gymnopedies". But in the deepest caverns of the canon-creating machine he was an important precursor of the impressionists more than a force in his own right. All that changed, slowly. John Cage's "Cheap Imitation" and his championing of Satie in general certainly helped. The marathon performances of the potentially endless "Vexations" and the recognition of that and his "Furniture Music" as the first minimalist works perhaps did as much or more. And now in a world where post-modernism and radical tonality seem to connect often enough to Satie's original sense of untraditional tonal works, all that seems to have brought him even further to the front as a father of the music of today. His fabulously eccentric music turns out to be much more avant garde than we realized, even if it has taken 100 years for us to get there. Philip Corner's two-CD set of Satie's piano music, Satie Slowly (Unseen Worlds UW 12) brings us further revelations. Maestro Corner has chosen some of the very familiar pieces but also some traditionally seen as a bit more "problematic". He takes them all at a crawl, very slowly, and it turns out we hear the music anew. Somebody in a New York Times review years ago (I don't remember who) noted that music that is at first fairly unfamiliar to audiences tends to be taken at a faster tempo in the beginning. Later when we all get very familiar with the music the tempos tend to slow down, lingering on each passage, savoring the music more. He was speaking of Mahler. That would certainly apply here, to Satie. But moreover it gives the music the quality of a sea change. The lyrical "Gymnopedies" or one of the "Gnossiennes" just sound that more lyrical in Corner's hands. But the "Ogives", the "Fanfares of the Rose+Cross", the "Chorales" sound that much more stark and open. They sound like a post-modern music made today, only they are not. 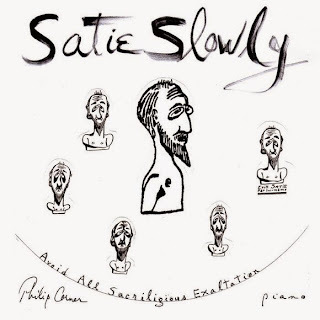 For that reason this Philip Corner version of Satie's piano works, though not complete, seems indispensable. One would perhaps also do well to have the complete Ciccolini (if you don't already) as a comparison and a benchmark of the more orthodox readings. Satie Slowly is another kind of wake-up call to the appreciation of the composer as our forebear, a father of what is happening in the present. Aside from that to hear all this in snail tempo is a sheer delight, a poetic Bacchanal of Satie the tonal sensualist, the painter of contemplative yet mysterious chasms of possibility. Bravo!